LET THERE BE LIGHT tells a story about an alcoholic atheist mourning his dead son who revels in putting down religion, especially Christianity, but who must reconsider his life after a near-death experience where his son in Heaven tells him, “Let there be light, Daddy.” LET THERE BE LIGHT ends up being an emotionally powerful, insightful and inspiring drama showing moviegoers that Jesus Christ enlightens all people and brings us abundant life and joy, even in the midst of death. LET THERE BE LIGHT is one of those faith-based movies that gets better and better as it goes along. It tells a story about an alcoholic atheist mourning his dead son who revels in putting down religion, especially Christianity, but who must reconsider his life after a near-death experience where his son in Heaven tells him, “Let there be light, Daddy.” LET THERE BE LIGHT ends up being an emotionally powerful, insightful, inspiring drama showing moviegoers that Jesus Christ enlightens all people and brings us abundant life and joy, even in the midst of death. The next day, Sol visits his ex-wife Katy’s house to pick up his two sons for the weekend. The movie reveals that Sol became bitter and angry toward Katy’s Christianity because of their first-born son’s death. So, he decided to proselytize for atheism. Clearly, however, Sol’s bitterness, derisive attitude and love for alcohol makes other people uncomfortable, even his supposed friends. This experience so disturbs Sol that his first response is to wallow in more alcohol. However, his ex-wife, Katy, reaches out to him. She encourages him to see her pastor, who gives Sol an unconventional but convincing defense of the death and resurrection of Jesus Christ, and why it matters. These events lead to Sol’s conversion and baptism. He and his wife develop a great idea to share the Gospel of Jesus with the entire world based on what Sol’s son told him. However, a new tragic circumstance threatens their plans. The beginning of LET THERE BE LIGHT might strike some viewers as a little strange and risky, but the movie, including the direction and acting, gets better and better as the story unfolds. Kevin Sorbo delivers another charismatic performance as the troubled atheist. His transformation is very believable and may remind many former sinners of the ways Jesus transformed their lives too, including the newfound energy and hope that comes with salvation. 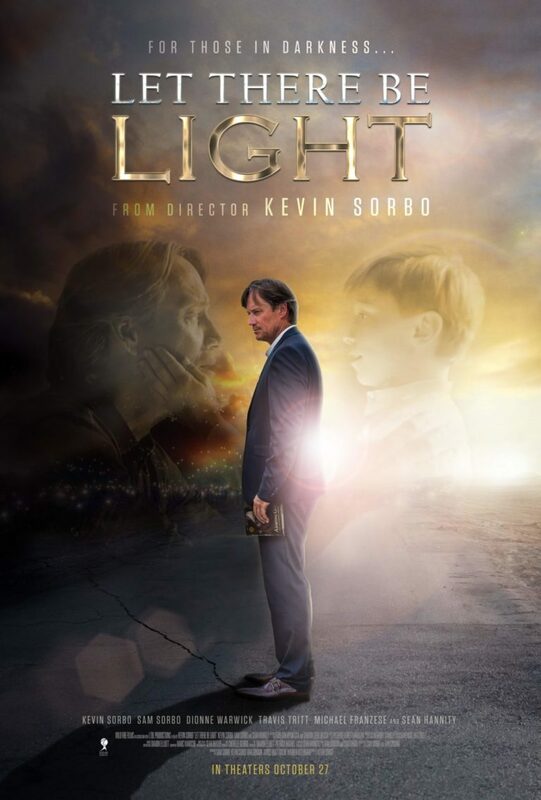 The revelation, acting-wise, though, in LET THERE BE LIGHT is Kevin Sorbo’s own wife, Sam Sorbo, who delivers a powerful, nuanced performance as the atheist’s wife. Of course, Sam had already established her own successful acting career before she and Kevin met, got married and had their three children. So, her acting chops should really come as no surprise. The title for LET THERE BE LIGHT apparently is inspired by John 1:9, which says that Jesus Christ “enlightens” all people. Of course, there are also echoes of other biblical passages, such as John 8:12, where Jesus says, “I am the light of the world. Whoever follows me will not walk in darkness but have the light of life.” The screenplay written by Dan Gordon and Sam Sorbo takes full advantage of this visually, spiritually ripe theme until the last frame. Also, Michael Franzese as the unconventional pastor presents a unique but convincing, full-throated defense of the basic tenets of Christianity, focusing on the death and resurrection of Jesus Christ. The pastor also beautifully connects this Gospel of Jesus Christ to the real meaning behind Christmas, the birth of Christ. MOVIEGUIDE® has read many such defenses from many historical scholars and experts on these subjects, but the pastor’s defense in LET THERE BE LIGHT is definitely one of the best written and most convincing, despite its unconventional nature. It has the sturdy sound of reality to it. Even better, the movie cleverly takes these concepts to carry the story forward to its conclusion. Ultimately, LET THERE BE LIGHT not only shows moviegoers that the Gospel of Jesus Christ enlightens all people, it also brings us abundant life and joy, even in the midst of death. Hopefully, it will get the kind of theatrical distribution and positive reaction it deserves. Very strong Christian, biblical, moral worldview pointing to the love, joy and light Jesus brings. No foul language, but a couple borderline verbal references to God that play like appeals to Him. drunk driver crashes his car and has a seizure at one point on stage and is sometimes troubled and angry with a light volcanic temper. Angry and troubled atheist author mocks belief in God and Christianity, and has developed a hedonistic attitude, but all that is rebuked and resolved positively when he comes to Christ, plus atheist author’s publicist turns out to be a real phony. LET THERE BE LIGHT tells a story about an alcoholic atheist, Sol Harkins, mourning his dead son. Bitter and angry with God, Sol enjoys writing books mocking belief in God, especially Christianity. However, at a party for his new book, Sol becomes very drunk and, driving home, crashes his fancy car. Sol has a near-death experience where he sees his son alive and happy. His son repeatedly tells him, “Let there be light.” The experience eventually causes Sol to reconsider what he believes and how he acts. After a unique, risky beginning, LET THERE BE LIGHT gets better and better as the story unfolds. Kevin Sorbo delivers another charismatic performance as the troubled atheist. Kevin’s real-life wife, Sam, who had her own successful acting career going before working with Kevin on HERCULES, is a revelation as the atheist’s ex-wife. They have a natural onscreen chemistry. Best of all, LET THERE BE LIGHT ends up being an emotionally powerful, insightful, inspiring drama showing moviegoers that Jesus Christ enlightens all people and brings us abundant life and joy, even in the midst of death.